Front text: I want my vote! 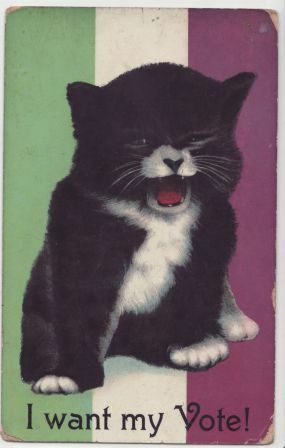 This postcard features a kitten sitting in front of the three colours of the Women’s Social and Political Union, with the caption ‘I want my vote’. 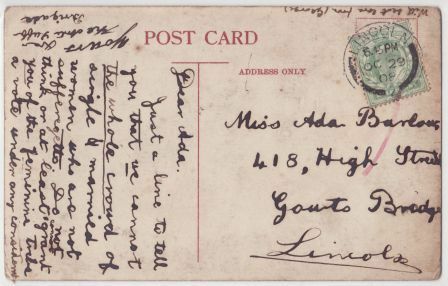 The postcard does not carry the name of a publisher or printer. Dating it is also difficult due to the lack of documentary records for postcards although it is probably from around 1908. This card seems to be one of the most common suffrage-themed cards judging by how readily available it is on eBay. It was the first suffrage-related postcard I bought and I now have a number of copies – I enjoy the messages written on the reverse of the cards. The colours shown in the image were adopted in 1908 by the WSPU and were said to be representative of: white for purity, green for hope (youth or regeneration), and purple for dignity (loyalty or courage) (Tickner, 1987). This postcard also featured in a more recent (2007) article on humour, used by and against those in the suffrage movement*. The writer, Krista Cowman, notes the use of images of animals and in particular of cats by commercial printers and comments that whilst this specific postcard is not ‘overtly hostile […] it could be read as an attempt at infantilization. Such images would appeal to those who found the suffrage campaign amusing and to its more passive supporters as it is not an overtly anti-suffragette image’. Reflecting its popularity it is also featured in several books about suffrage cards – page 89 of Watson (Suffragettes and the Post), page 47 of McDonald (Vindication! A Postcard History of the Women’s Movement) and page 57 of McQuiston (Suffragettes to She Devils: Women’s Liberation and Beyond). 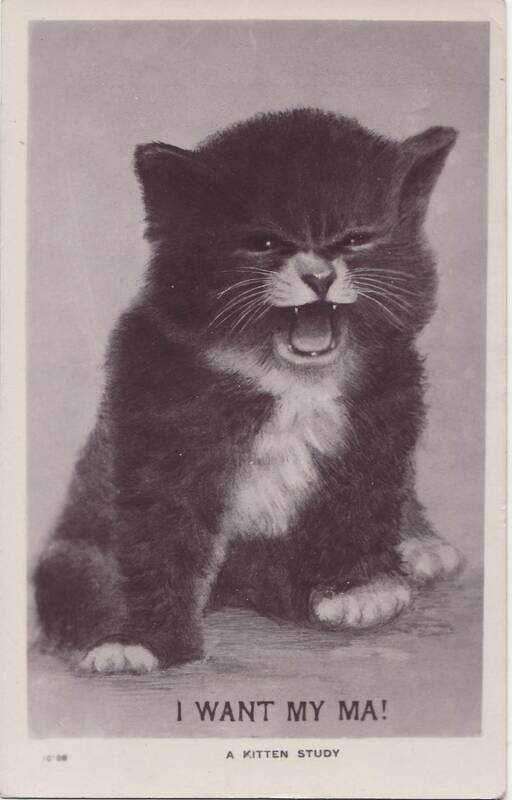 The image of the kitten does seem to have been re-purposed to cater for consumers interested in the suffrage debate, I have seen several of other postcards dated to as early as 1906. The two below are captioned ‘I want my Ma!’. 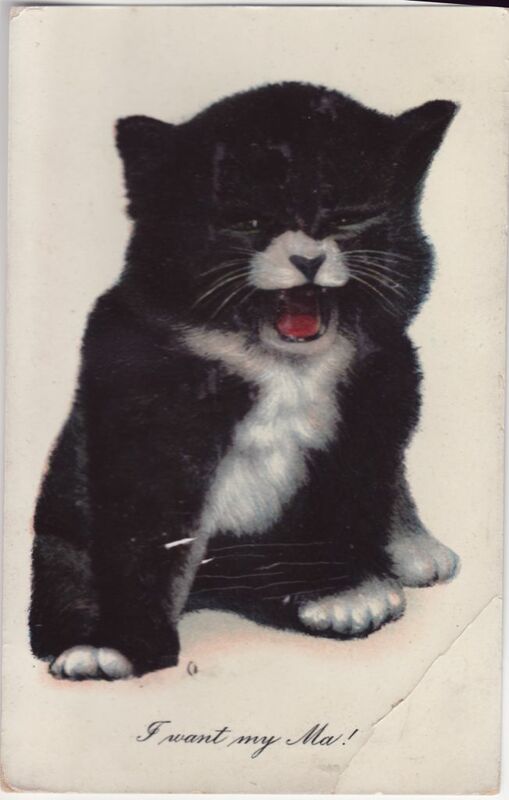 The first is postmarked 1906 and includes on the front ‘A kitten study’ under the main caption. The rear is also marked ‘The Wrench Series. Printed in England’. The second, postmarked 1911, has dropped the ‘kitten study’ reference and the rear only indicates that it was ‘Printed in Saxony’. The postcard company Evelyn Wrench went out of business in 1906 so it is unclear under what company the images were made. Another postcard using this image carries the caption ‘I’ve got my pension!’ (the Old Age Pensions Act was passed by Parliament in 1908). I have 7 different copies of this postcard. The image of one is below and the others are offered only in transcription. Sent to: Miss Ada Barlow / 418 High Street / Gouts Bridge / Lincoln. Postmarked: Lincoln, October 29th 1908. Sent to: Mr E. Cole /134 Thorpedale Rd / Hornsey Rd / N London. Postmarked: Finsbury, November 17th 1911. Sent to: Miss A White / c/o Mrs Douglas / Groton House / Walmer. Postmarked: Location unclear, October 17th 1908. Sent to: The Misses Claxton / 102 Gloucester terrace / Hyde Park / W.
Postmarked: Hampstead, August 9th 1909. Kenilworth College. / Hastings / Sunday / My dear Mollie. / I am just / send you a P.C. / to add to your / collection. / Give my love to / Auntie, Uncle, / & baby. / With love. Ella. Sent to: Miss Seaper / Hillside / Rodley / Newham / Gloucester. Postmarked: Stamp removed – no information. Sent to: Mr […] / Sunny-Side / Penards Cross / Nr Slough / Bucks. Postmarked: London S.W. Oct 31 08 5.15 PM. Sent to: Miss Myrtle Ceale / 1005 Park Ave / Omaha / Neb. * Cowman, Krista (2007) “Doing something silly”: the uses of humour by the Women’s Social and Political Union, 1903-1914. International Review of Social History, Vol 52, pp. 259-74.